Deas and I spent a night at the Mammoth Springs campground in Yellowstone earlier this week, and ended up having a pretty interesting experience. 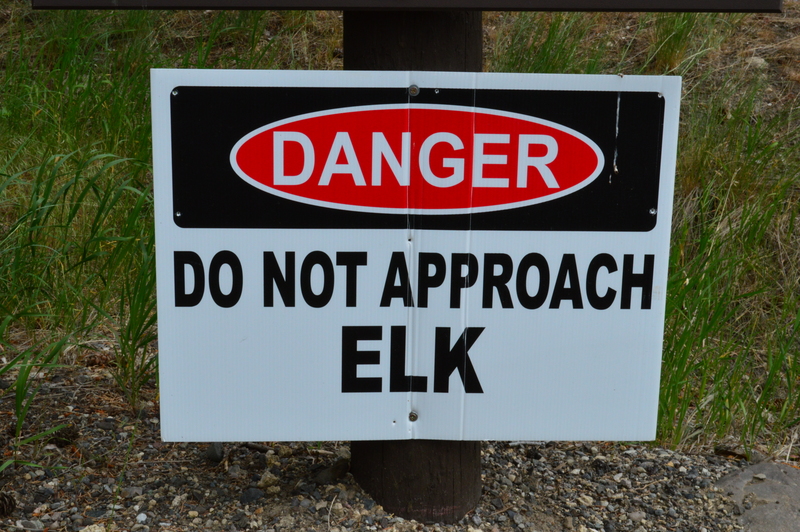 When we drove into the campground, there were signs everywhere warning people not to approach the elk. 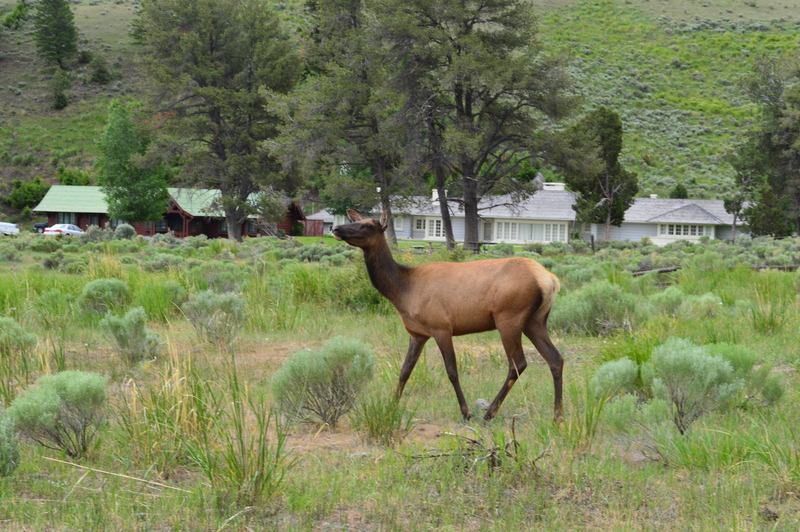 I spoke to the woman who was camping next to us, and she said that they camp there every year and always see elk. So I figured there was good chance we would see one, but I didn’t give much thought to what would happen. 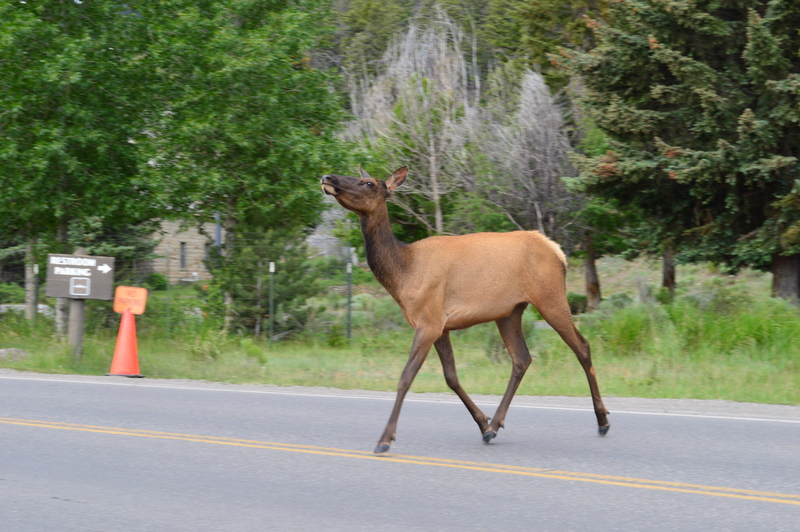 I naively thought that the danger in approaching the elk was to the elk, not to the human. There is a small trail that leads up a hill from our campground to the Mammoth Springs. So shortly after getting the RV all set up, we decided to take the dogs and walk that trail. Just as we get to the foot of the trail, Deas looks up on the hill and sees an elk, so he stopped to point it out to me. I looked up, and saw the elk in the low sage brush about half way up the hill. As soon as I looked at her, she looked up, and looked right at me. We took a few more steps going up the trail, and then I noticed that the elk is not only looking right at us, she’s coming down the trail – straight towards us. We take a few more steps; I look at the elk. Her eyes are LOCKED on us and she’s now picked up her pace. Deas: “You’re being ridiculous! She probably just wants us to feed her. Let me walk ahead a few feet and see which way the trail goes.” With that he hands me Nikki’s leash, so I’m now holding all 3 dogs’ leashes, my husband is walking away from me, and the very focused elk is now about 20 feet away, and approaching fast. Now I’m seriously freaking out because the elk is so close I can hear her footsteps. I spin around and start running, dragging the dogs with me. Deas at this point has agreed that the elk is INDEED coming right at us, and runs back to me and grabs Nikki’s leash and yells to me “Get behind a tree!” So I’m running with Jake and Shorty, looking for a tree that will trick an elk, and he’s behind me with Nikki. I hear Deas yell out “NO!! !”, and I spin around and see that the damn elk is now two feet from him and Nikki. Deas is holding his hand out like a traffic cop and yells “NO!! !” again. Oddly, the elk seems to listen, but keeps a keen eye trained on Nikki. In my memory, she’s about 25 feet tall. In reality she was only a few inches taller than Deas, but Deas is 6′ 5″! That elk was looking at him eye to eye. I turn around to run again, Deas starts to follow me, but the elk keeps coming at us. Deas starts yelling at her again. I see a small shed and I run over to it and try to hide behind that, because that seemed to make more sense than hiding behind a tree. Deas catches up to me, the elk is now on the other side of the shed, so we run back towards the road. She’s still watching us, but she seems satisfied that we’re retreating. So now I’m really curious what just happened. Was she really threatening us, or did she want us to feed her like Deas suggested? We asked the ranger, and she told us that yes, the elk really was threatening us, and that she probably has a baby nearby. She said that elk have been known to ram people with their heads. And oh, by the way – elk hate dogs. Great. Deas’s theory is that the elk thought Nikki was a wolf, and that’s why she backed off. I’m not sure about that, but after that experience there was NO WAY I was going to walk that trail again, dog or no dogs. We had really been hoping to have a cool wildlife encounter when we were in Yellowstone, I just didn’t want it to be one where I thought I was going to be trampled! The really frustrating thing is that I had my iPhone in my pocket, and my Nikon around my neck. But in the heat of the moment, taking a picture was the last thing on my mind. 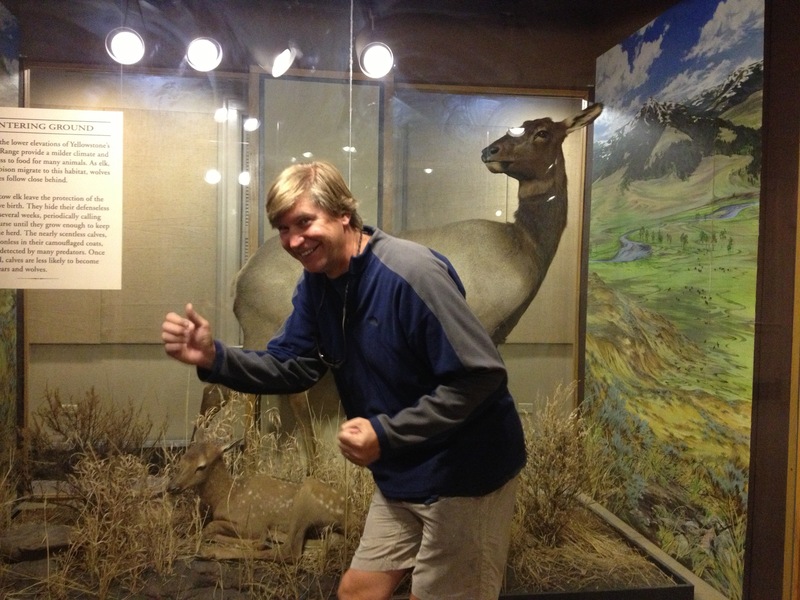 However, we found this stuffed elk in the visitor center, so Deas staged a reenactment. That picture just about makes it all worthwhile. Note to self…if you see elk approaching, get the hell out of there! Lesson learned from the Nealy’s…thanks for sharing! What a crazy experience! That is terrifying! I am not sure if I would freeze or run for my life. It really was pretty scary! I didn’t know whether to run or not either. Since I had our dogs with us, I was really afraid the elk would go after them so I chose to run. I’m just glad she backed off when she did, and I’m really glad that it was a female and not a male! Next Next post: Grand Tetons and Yellowstone – in 2 days!